Lee & Rivers LLP (formerly Lee, Rivers & Corr LLP) practices Family Law at the highest level of skill, knowledge, sophistication and versatility. Long recognized as a leader in its field, this preeminent firm of nationally recognized partners and talented associate attorneys represents clients in complex matrimonial financial matters, contested child custody disputes and other associated substantive facets of domestic relations law practice. Lee & Rivers LLP believes that it serves clients best by applying the benefits of its collective experience, analytical approach to cases, and hard-earned and fervently guarded reputation for integrity and discretion. Lee & Rivers LLP lawyers never forget that clients are people who deserve respect, firm guidance and understanding during a most difficult life transition; and that those clients who have children can never lose sight of the need to protect their ability to collaborate with the other parent for the duration of their lives, as well as during litigation. Lee & Rivers LLP lawyers stress the creative use of intellectual, persuasive and technical expertise. 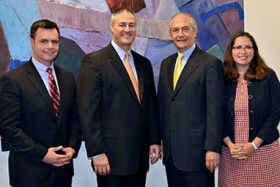 The firm utilizes its depth of attorney talent to address clients’ needs with equal facility in negotiation, trial, appeals and in the alternative dispute arenas of mediation and arbitration. Every Lee & Rivers LLP client has the justified expectation of zealous advocacy, reasoned decision-making and effective implementation of strategy and tactics, all geared towards obtaining the best possible results for the client from the broadest perspective. Established in 1984 Lee & Rivers LLP now serves its clients through its legal group consisting of partners David H. Lee, Robert J. Rivers, Jr., Jessica M. Dubin and James J. Richards, and associate attorneys Lindsay V. Mason, Claire Koehler Forkner and Holly A. Hinte. The firm’s Back Bay office is conveniently located and easily accessible from all points of Greater Boston. The firm practices in all venues of the Commonwealth of Massachusetts.